Food for thought. Is it not? But the death business is booming. Today, November 1, it is All Saints Day. (In France it is a public holiday.) Yesterday, October 31, it was the Day of the Departed. These two days are therefore always solemn ones here in France; today, is the day that the French visit cemeteries and leave huge pots of Chrysanthemum plants on the graves of their loved ones. The Chrysanthemum is therefore the flower of the dead here in France; it is a flower which has always given me the creeps. There is not a newspaper in France this day which does not have a front page story on what a rip-off death has become. Dying being a necessary evil, and a very upsetting time for those who remain behind, funeral parlors have, according to the headlines, been taking advantage of mourners’ grief to charge them astronomical fees for funerals, gravestones, wreaths, burial and cremation. The funeral, be it for cremation or burial: €2500/4000 ($3485/5575 / £2170/3500).This does not include the cemeteries’ fees (yes, one needs to have a grave dug and filled up afterwards and these are paying services) but it does include the undertakers’ fees. The coffin: From €1000 and the sky’s the limit (no pun). ($1400 /£866). The independent consumer’s monthly, Que Choisir, found that undertakers do hike up the price of a coffin. For example for one they had paid little over €400 ($560 / £346) for, they would charge more than €2000 ($2790 / £1740). Some undertakers will even put a price tag of €10,000 ($14000 /£8600) on the coffin. The tombstone: Between €2400 and €3290. ($3350/4580/ £2000/2850). A burial plot can cost €15,000 ($21000 / £13000), but it will be yours (your family’s) for eternity unless the grave is abandoned. By abandoned I mean, no other member of the family is laid to rest there and no one visits the grave and it falls into dilapidation. Two years before a burial plot is to be reclaimed by the cemetery, a notice of warning is left on the grave. If no one comes forward to protest the reclamation, the buried ones are removed and the remains are cremated and the plot is put back on the market. One is usually buried where one lives (for obvious reasons),but there are popular and posh cemeteries. 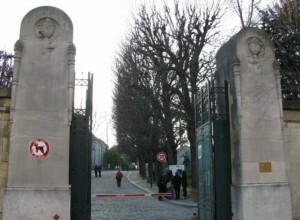 The poshest in Paris is Père Lachaise. If you fancy being buried there, know that there are always a few plots for sale there, but it will cost you about €50,000 ($70000 / £43500). More statistics show that in 2009 538,000 people had passed away in France. It is estimated that in 2010 the number of deaths would have increased to 800,000. Of these only half would have taken out funeral insurance. There are 3000 funeral parlors in France and in 2009 they declared an income of €5 billion. What usually happens when someone passes away is that relatives go to the funeral parlor closest to their home. The funeral parlor makes the necessary arrangements to have the coffin and the body transported by hearse from the hospital to the cemetery. For such a transport one needs permission from the local police, and permission must be granted by the Prefect of the region under Section R 2213-22 of the Code Général des Collectivités Territorales. Such permission is not free of charge; one has to buy a kind of permit on which the route from the hospital to the cemetery is stipulated. Having said all this, I have to add that from January 2011, dying is going to be taken in hand. A new law will make it compulsory for funeral parlors to give mourners a detailed quotation of what a funeral would cost. However, the French are turning to cremation rather than burial. Some are describing it as ‘neater’ but do not ask me what they mean. Once, human ashes could be kept at home, but since 2008 this has been illegal. Human ash should therefore be placed in a columbarium or in a funeral vault in a cemetery. To remove human ash from French territory also requires permission from the police, as well as permission from the police in all of the areas (towns etc) through which the ash would be transported. Urns must be approved by the health authorities. This means that if you should walk past a funeral parlor and an urn catches your fancy, you would not be able to buy it for the day of your cremation because it might then no longer be an authorized recipient for human ash. You can, in fact, only buy an urn from an undertaker on the death of someone. In 2006 there were 117 crematoriums in France. Twenty-five percent of those who had died that year were cremated. The number has steadily increased so that in 2009 it was twenty-eight percent. I’m gobsmacked at those prices. I suppose it comes out of the deceased’s estate, but goodness, talk about a rip-off. What with death duties and a funeral you’ll need a fair-sized estate before the heirs see a euro cent of it! Jo, was it not a very depressing thing working in a funeral home. Yes, I do agree, funeral costs can be extortionate. Unfortunately a lot of funeral homes have been taken over by big business who’s only concern is the bottom line and they don’t give a damn about the customer. I speak from experience, I worked for a funeral home for about 6 years and we were taken over by a big American company who preached one thing and practiced an entirely different set of values. Luckily Matt and I have already purchased our cremations which are ensured so they will be paid up no matter when we die.